7) Olivia’s Café – Disney’s Old Key West Resort is home to a charming full service restaurant that offers up hearty and comforting home cooking inspired by the tastes of the Florida Keys. 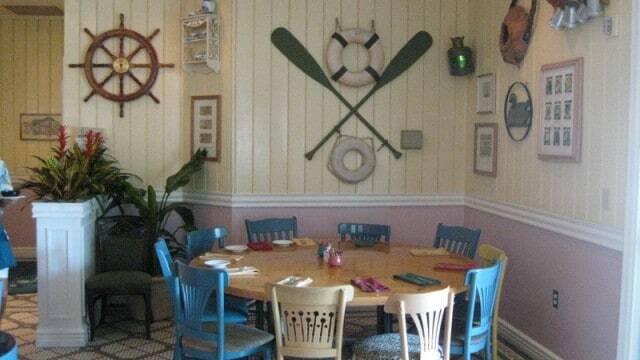 Olivia’s Café is open daily for breakfast, lunch, and dinner and guests can enjoy their meals in a bright and cheery dining room featuring bright colors, nautical details, and a beautiful outdoor patio. In order to create the most value of a meal at Olivia’s Café, guests should opt to visit for either lunch or dinner and begin their meal with the Caesar Salad with Chicken appetizer which costs $15.00 and features chopped romaine lettuce accompanied by parmesan, house-made croutons, and Caesar dressing. Guests should then order the Slow-Cooked Prime Rib as their entrée. The option costs $37.00 and features a 14 ounce cut with Olivia’s potatoes, seasonal vegetables, and cabernet demi-glace. Olivia’s Café serves up three desserts which are equally valuable at $8.50, and guests can choose between the Mascarpone Cheesecake with seasonal fruit topping, the Flourless Chocolate Cake with fresh seasonal berries, or the Mile Marker Zero which is a tropical panna cotta. In terms of cocktails, the most valuable option to order is the Magical Star Cocktail which combines X-Fusion Organic Mango and Passion Fruit Liqueur, Parrot Bay Coconut Rum, pineapple juice, and a souvenir multicolored glow cube.